Motivated by a capacity allocation problem within a finite planning period, we conduct a transient analysis of a single-server queue with Lévy input. From a cost minimization perspective, we investigate the error induced by using stationary congestion measures as opposed to time-dependent measures. Invoking recent results from fluctuation theory of Lévy processes, we derive a refined cost function, that accounts for transient effects. 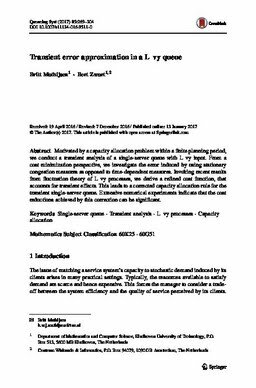 This leads to a corrected capacity allocation rule for the transient single-server queue. Extensive numerical experiments indicate that the cost reductions achieved by this correction can be significant.